Thank you to Wanda Palmer and all of the dedicated real estate professionals who made this evening a huge success. 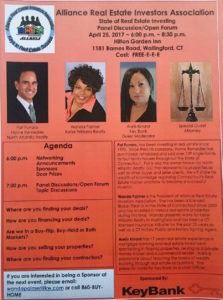 It was a privilege to be invited to such a well-organized, informative evening, focused on sharing ideas about how to serve the real estate needs of Connecticut in the most efficient way possible. I learned a great deal from the experience, and I look forward to more events like this in the future! Pat is the founding Member of Home Remedies, LLC, and for the past 18 years, has enjoyed helping Connecticut homeowners navigate the challenges of home-ownership. He earned an MBA at UConn, and is the Owner/Broker at North Atlantic Realty. LLC. Good News For The Housing Market? Will Millennials be discouraged by rising mortgage interest rates? What Should I Do If I Can’t Pay My Mortgage? How Can I Sell My House in This Market? Housing Starts Up In June, But is it Enough to Ease the Inventory Shortage? Sell Your House in 9 Days! © Copyright 2019 Home Remedies, LLC.